BOSTON (AP) Marcus Smart helped complete a furious comeback for Boston on two plays he never touched the ball. Smart drew an offensive foul on James Harden with 7.3 seconds left, getting the ball back in time for Al Horford to sink a hook shot with 3.7 seconds left, and the Celtics rallied from a 26-point deficit to beat Houston 99-98 on Thursday night. After Horford’s shot, Smart did it again when he drew another foul on Harden and the Rockets ran out of time. Kyrie Irving scored 26 and Jayson Tatum finished with 19 for the Celtics, who held Houston to just nine field goals in the second half while tying the largest comeback in the NBA this season. 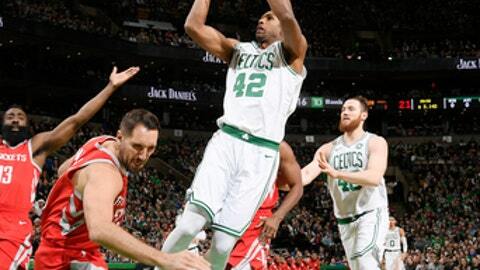 Smart and Terry Rozier had 13 points apiece and Horford finished with nine points and eight rebounds. Tatum made a layup with seven seconds left to pull the Celtics within 98-97, then Smart had position on Harden for an offensive foul that gave Boston the ball. Horford converted from the lane to put Boston up for the first time in a game Houston had led throughout and dominated until midway through the third quarter. Harden finished with 34 points and 10 assists. Eric Gordon scored 24 points for Houston, which shot 25 percent in the second half and lost its fourth straight. The Rockets had one last chance after Horford’s go-ahead hook shot, but Harden was called for another offensive foul and time expired after Horford missed his second free throw. Houston opened the game on a 12-0 run and led 62-38 at halftime. After committing six turnovers in the first half, Houston had seven in the third quarter and Boston capitalized by outscoring the Rockets 31-16. Irving scored 12 in the third quarter as Boston picked up its defense, holding Houston to just four field goals in the period. Boston got within a point a couple times in the fourth, but couldn’t quite catch the Rockets until the final seconds. After Smart drove for a layup and pulled Boston within 96-95 with 13.5 seconds left, Harden drew a foul and made both free throws to put the lead back at three. Rather than going for the 3-pointer, Boston went to Tatum for another layup, then Smart took an offensive foul by Harden on the inbounds play. Houston’s lead was in the 20s for nearly all of the second quarter and much of the third before Boston pulled back within range on a 12-0 run. Rockets: Veteran swingman Gerald Green, who signed a free-agent deal with the Rockets earlier Thursday, finished with two rebounds and no points in 11 minutes. … The Rockets’ 62 points in the first half were the most scored on the Celtics in the first two periods of a game this season. … Houston point guard Chris Paul missed his third straight game with a groin strain and the Rockets fell to 10-7 without him. … The Rockets were also without center Clint Capela, who has a right orbital fracture. Celtics: Were just 5 of 19 in the first quarter while scoring 12 points, the second-lowest total for a quarter by the Celtics this season. … Boston committed eight turnovers in the first quarter. Referee Mark Lindsay missed the game with a sore back, leaving Tony Brothers and Gediminas Petraitis to officiate the game on their own. There were plenty of disputed calls throughout, including one that got Boston coach Brad Stevens and Marcus Morris technicals with 1:56 left in the third. Harden was the most vocal about the officials being down a man for the entire game. Rockets: Wrap up a three-game road trip Friday at Washington. Celtics: Host Brooklyn on Sunday.